What happened in Chambersburg and Fairfield in April of 1861? Certainly not events which were earth shattering for the nation as a whole. But to the citizens of the bustling southern Pennsylvania urban centers, it was their world. 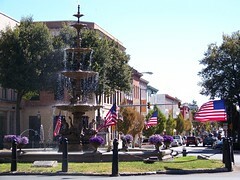 Chambersburg, just four days after Major Anderson officially surrendered his post in Charleston Harbor to rebel forces and three days after Lincoln made his call for 73,000 troops from the loyal states to put down the rebellion, held a reportedly unanimous meeting for Union. Honorable Wilson Reilly, chair of the meeting and former Democratic Congressman (1857-1859), was reported to have, "made a powerful and patriotic address which was received with deafening applause." The politician, "stated his readiness to support the Government by every means at his disposal and his willingness to shoulder a musket and march to the field of battle if needs be to save the flag of his country from dishonor." Reilly would not quite shoulder a musket, although he put his money where his mouth was and became an officer in the McClure Rifles. He lasted through July as commander of the company serving in the Pennsylvania Reserves, before bowing out due to health reasons. At the same union meeting in 1861, entered Captain P. B. Housam, the commander of the Chambers Artillery, a local militia unit which chiefly participated in patriotic ceremonies before the war. Housam was almost instantly cheered by the assembly. 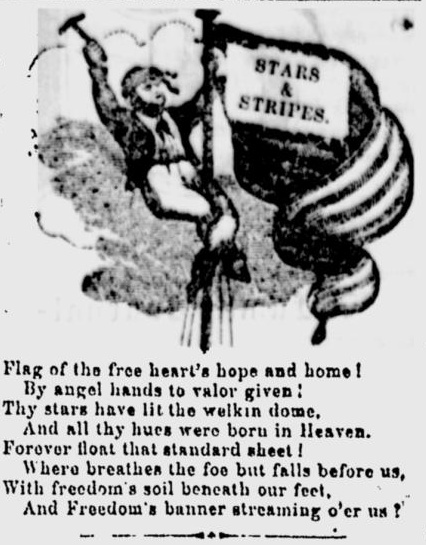 The Captain's appearance, the Valley Spirit reported, "was greeted with three of the heartiest cheers we ever heard in a public assemblage." The citizens of Chambersburg presented their hometown defenders with a banquet the following night, as well as scraping together, "a fund of several thousand dollars... to aid the families of the absent soldiers should they need it, during the service of the men from their homes." These events of April 1861 are not as exciting as the Burning of Chambersburg, when war hit Chambersburg's doorstep for the third time, but they are the events in which the people of 150 years ago participated. Certainly one could see in their mind's eye a reenactment of a political rally, followed by a community dinner and firing of a battery of reenacted "Chambers Artillery" guns. The historical events seem tailor made for modern reenactment for modern visitors. Fairfield, likewise, had citizens rise up in support of their government and against the rebels in South Carolina. On 22 April, Fairfield's men hoisted a, "Liberty Pole," above the borough. "The Pole is 110 feet long, and the flag a neat and graceful one." The banner was the, "handiwork of the ladies, who ever exhibit their true devotion to the Union." The community, men and women, were, "ever willing to contribute all they can to their country." The union festival, punctuated by, "long-continued, enthusiastic cheers," included a number of patriotic speeches by local lawyers. The speakers, "extolled the object and commended the zeal and devotion of the brave sons of Hamiltonban [township] in this exhibition of their loyalty to the Government of our Country." The Liberty Pole or Union Pole was a symbol which popped up across Adams County and the nation in April of 1861. Gettysburg's diamond sported a 120 foot pole by late April. 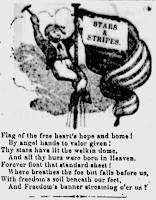 A quick search of the American Memory collection will turn up dozens of images like that which the Gettysburg Sentinel ran the week following its coverage of Fairfield's Liberty Pole, a man nailing the Stars and Stripes to the apex of a pinnacle. A town picnic in Fairfield, a festival with food and period actors, centered around the reenactment of the raising of the Liberty Pole and the patriotic orations presented that day would allow citizens and visitors to gain a glimpse of what Fairfield's citizens experienced in 1861. Stepping outside the comfortable box of repeating the same events can be hard. New events require new research. Falling prey to 'Three Days in July' syndrome is inherently human. Once we have an event which works, we tend to continue the success by cloning it over and over. But in this case, success is bred through variety, not through rote repetition. I am not saying that the Three Days in July (or whichever days in whichever month) are not important. On the contrary, they are what give a place the special meaning which magnifies the previous and subsequent events. 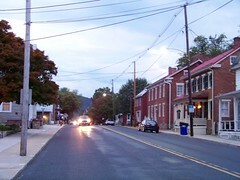 Gettysburg or Chambersburg's reaction to the outbreak of war is not in and of itself unique or important. But the events of April 1861 take on a special meaning when viewed through the lens of the carnage to come. Gettysburg can become a unique lens, as the battle just two years later colors how visitors view and process the scene of men marching off to war. We all know those men will return home to disastrous results. With a little ingenuity, we can tease out the sesquicentennial events as they come along. The last thing this commemoration needs is a flat retelling of the same tale every few months. We as an historical interpretive community need to help the public treasure the commemoration of each sesquicentennial anniversary as they come, acknowledging and highlighting the uniqueness of each day of the war and each American's experience on those specific days.